Teraphobia (fear of monsters) is extremely common in pre-school-age children. It generally lessens during the early elementary years and is highly uncommon by the time a child reaches middle school. In teens and adults, the fear of monsters is a rare but potentially life-limiting phobia. Fears are a normal, healthy part of childhood development. They help children learn to make sense of the world around them and develop coping skills to last a lifetime. For this reason, phobias are generally not diagnosed in kids under the age of 18 unless they last for more than six months. In children, the fear of monsters often takes a nonspecific form. Rather than fearing Frankenstein, Dracula or Godzilla, the child is afraid that "a monster" lives under his bed or in her closet. Nonetheless, asking the child to draw a picture of the monster may provide clues to an environmental trigger. Some drawings resemble a TV cartoon character, a kidnapper who appeared on the evening news or even a neighbor whom the kids in the neighborhood refer to as "creepy." In these cases, limiting the child's exposure may help lessen the fear. Some parents use "monster spray" to help their kids battle this fear. Consider using a spray bottle — empty, partially filled with colored water or an aromatherapy spray — in a nightly ritual. 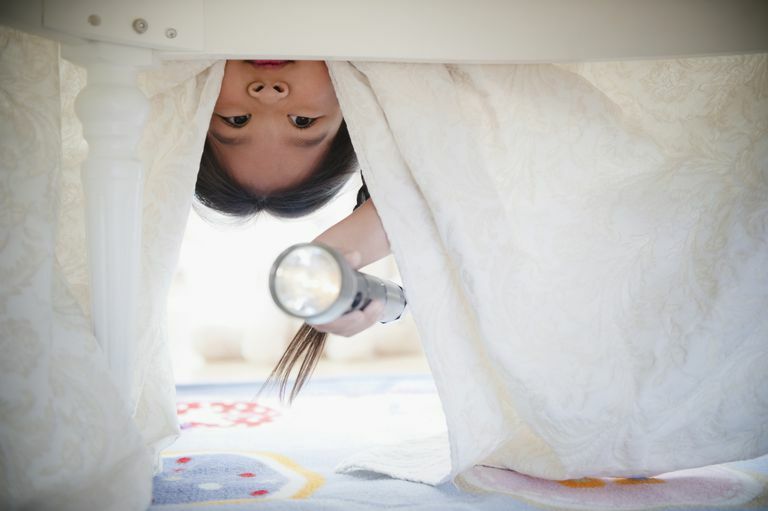 Spray the closet, under the bed and anywhere else that your child thinks the monster might be hiding. Be sure not to use anything that might be harmful to the child or damaging to fabrics or paint. Encourage soothing bedtime routines to calm the child's nerves. A warm bath, a glass of water, and a bedtime story promote relaxation and a soothing sleeping environment. If the child is afraid of the dark, consider providing a nightlight. Sleeping with the family pet might also provide a feeling of protection. Reward "brave" behavior. Some kids thrive on the attention their fears draw, so refocus your attention. Provide a brief "monster check" (and spray ritual, if desired) and then leave the room. Use stickers or other markers to track the nights that the child stays in bed all night without calling you into her room. When a week's worth of stickers have been collected, allow the child to trade them in for a favorite treat, such as a trip to the park or a batch of cookies. Never laugh at the child's fear, use the fear as a threat to deter bad behavior or belittle him for having the fear. Show respect and sensitivity for her feelings while reassuring her that everything will be fine. In older kids and adults, the fear of monsters usually takes a more specific form. Horror movies are responsible for many short-lived fears, especially if watched right before going to bed. These fears generally persist for only a few nights and are often eased by sleeping with a light on and pursuing mild distractions, such as watching light, comedic television. If the fear lasts for more than a few nights, it may be a sign of a true phobia. A more persistent monster phobia may be rooted in religious or cultural fears. The fear may be generalized or it may be of a specific type of creature, such as vampires, zombies, or ghosts. The fear of witchcraft is sometimes related to the fear of monsters. These phobias are often based on a blend of superstitions, urban legends, and religious teachings. For many people, knowledge is power. Studying ancient and modern myths about the feared monsters, particularly the science behind the legends, is often enough to curb milder fears. For more intense phobias, professional assistance may be required. An untreated monster phobia could worsen over time. Social isolation is a possibility, particularly for teens, whose friends may see the fear as babyish or ridiculous. Many teens thrive on legend trips, in which they go out in a group to face down nearby urban legends; horror movie marathons are a staple of teen nightlife. Kids who are afraid to participate are at risk of being mocked and shunned. Fortunately, like all phobias, monster phobia responds well to a variety of treatments. Because they are often based on other fears, it is important to decide on your primary goals of therapy. Do you believe that you may be harmed by a monster? Are you concerned about evil entities? Do you simply want to be able to enjoy scary movies and Halloween events with your friends? Are you concerned that your child might pick up your fears? The answers to these and other questions will help direct your choice of treatment. For example, if your fear of monsters is rooted in your religious or spiritual beliefs, your therapist might suggest spiritual counseling with your religious leader instead of, or in addition to, traditional therapeutic techniques. Children and Bedtime Fears. National Sleep Foundation. Ask Dr. Sears: Mashing Monster Fears. Parenting.com.